The designs of Norman Hartnell for Queen Elizabeth (later the Queen Mother) are among his best known. He first met Elizabeth in 1935, and continued making clothes for her until his death in 1979. 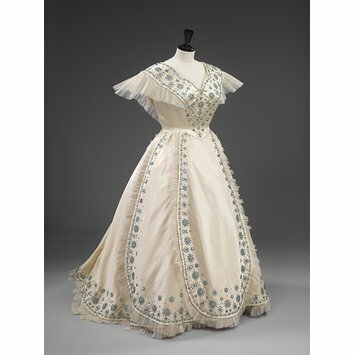 Among the many beautiful state gowns was this 1953 gown in ivory satin, featuring Hartnell's trademark of intricately detailed beading in a design of blue flowers. The skirt spreads out over a bell-shaped crinoline, a look which Hartnell first designed for Elizabeth in 1937, and which became her traditional evening look. In 1937, the new king, George VI asked Hartnell to create a new regal wardrobe for his wife. Hartnell's gowns included crinolines inspired by 1860s portraits of European royalty such as Elizabeth, Empress of Austria and the Empress Eugenie of France. This romantic, beautifully detailed and feminine look perfectly suited Queen Elizabeth and defined the style of clothing that she would wear as a key member of the British Royal Family. State evening dress of white silk satin with aquamarine and turquoise beaded embroidery in a frosted flower design. With a fichu collar around low neckline, and decorative panels trimmed with pleated net on the full crinoline skirt. Worn by her Majesty Queen Elizabeth, the Queen Mother. State evening dress of embroidered silk satin, designed by Norman Hartnell, London, 1953. 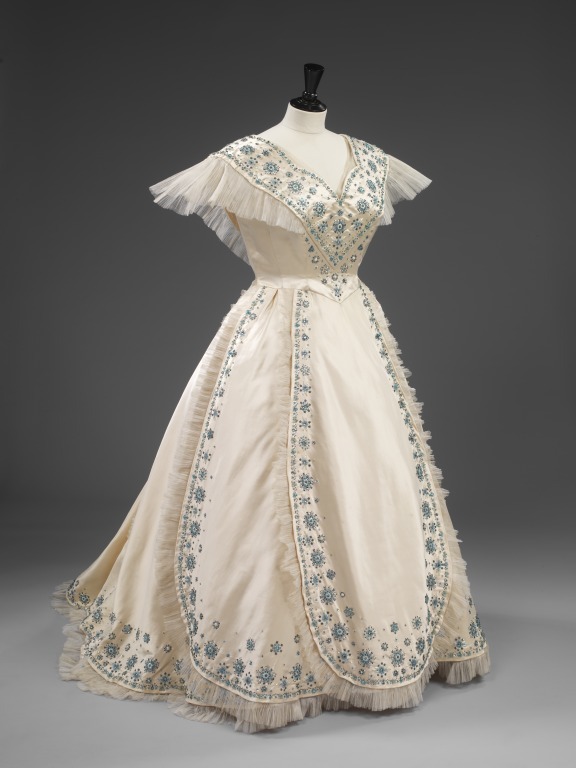 Norman HArtnell designed this state evening dress for Queen Elizabeth, the Queen Mother. The crinoline dress, with its V-shaped neckline and delicate tulle cap-sleeves, recalls mid-19th-century dresses as seen in the portraits of Franz Winterhalter. In his biography, Hartnell recorded his trip to Buckingham Palace, when first invited in 1937 to design for the then Queen Elizabeth. George VI showed the designer the Winterhalter portraits in the royal collection and suggsted that 'I should attempt to capture this picturesque grace in the dresses I was to design for the queen'.